Uravan Minerals Inc. (“Uravan”) and Cameco Corporation (“Cameco”) continue uranium exploration activities in the Thelon Basin this summer with a total of four diamond drill holes completed, and three more scheduled. Their current land use permit covers the 2007-2008 season, and they seek to extend their permit to cover a larger area of the Boomerang Claim south of the Thelon Game Sanctuary with two additional land use applications. Uravan notes the approval process for additional drilling on their Boomerang Claims has become much more difficult since a Mackenzie Valley Environmental Impact Review Board finding in 2007, which noted significant “public concern” for uranium exploration proposals in the upper Thelon River Basin and recommended against approving an exploratory drilling program at nearby Screech Lake (see MVEIRB public registry and final report). Two new land use proposals have been submitted by Uravan (EA0708-002 and EA0708-003), and they estimate the review process could take 9 to 12 months to complete. 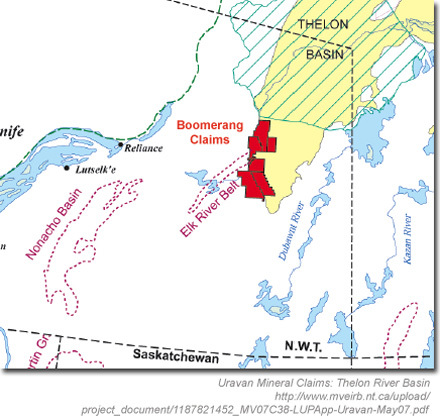 Bayswater Uranium Corporation has also submitted two proposals for exploratory mining projects (EA0708-004 and EA0708-005 ) on nearby lands in the Upper Thelon River Basin. Uravan Minerals Inc.: press release (.pdf), web site. Bayswater Uranium Corporation: web site. MVEIRB Public Registry: OBD0607-01 (current land use permit), EA0708-002 (new application – South Boomerang Lake), EA0708-003 (new application – North Boomerang Lake), EA0708-004 (new application – E1 Lake Mineral Exploration), EA0708-005 (new application – Crab Lake Mineral Exploration).